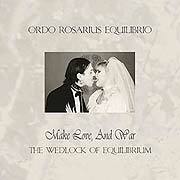 Perfected and refined, Ordo Rosarius Equilibrio returns once more with the second chapter of Make Love, And War – The Wedlock of Equilibrium. Darker, improved and additionally urging, Make Love, And War – The Wedlock of Equilibrium presents an additional 40 minutes of immaculate equilibrium on the illusive boundary of conjectural extremes. Accompanied by the sounds of acoustic guitars, cyclic soundscapes and martial percussions, Ordo Rosarius Equilibrio presents another ten songs on the threshold of the sensually seductive and morally reprehensible, gospels on the verge of the conjecturally acclaimed and what’s soon to be inflamed. MMake Love, And War – The Wedlock of Equilibrium embarks further and beyond the previous accomplishment and success of Make Love, And War / The Wedlock of Roses, and congregates into an amazing work which completes the bond of Love And War, making two become one, Roses & Equilibrium = Ordo Rosarius Equilibrio. —————– Click Herefor a list of the other CMI titles we distribute.